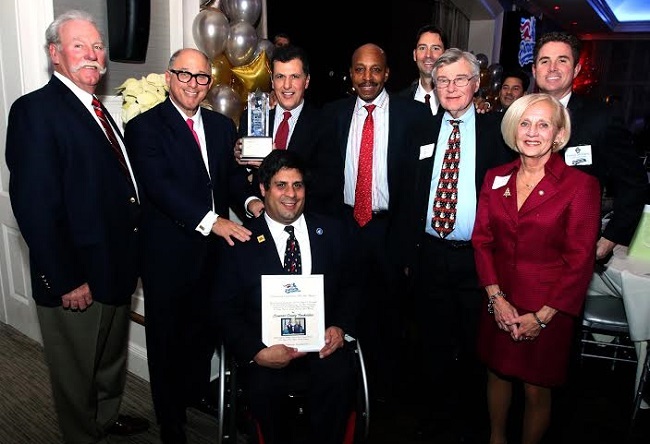 Bridgewater, NJ – Chairman Steve Kalafer and the Somerset Patriots presented the Somerset County Board of Chosen Freeholders with the Community Leadership All-Star Award at the team’s annual holiday reception for marketing partners on Wednesday, December 9th. The Community Leadership All-Star Award was created by the Somerset Patriots to recognize the outstanding achievements of an individual or organization to strengthen their community and to bring about positive change through their actions. The Somerset Patriots - represented by Kalafer, President/General Manager Patrick McVerry, Manager Emeritus Sparky Lyle, manager Brett Jodie and special guest Willie Randolph - presented Freeholder Director Mark Caliguire, Freeholder Deputy Director Patricia Walsh, along with Freeholders Brian Levine, Peter Palmer and Patrick Scaglione the award during the holiday event held at Fiddler’s Elbow Country Club. “The leadership and vision of the Freeholders has helped make Somerset County one of the most desirable places to call home for residents and businesses. Our long-time partnership with the Freeholders has helped bring affordable entertainment to families and the community at no cost to taxpayers. This is just one of the many feathers in the cap of our great friends and partners serving the people of Somerset County,” said Somerset Patriots Chairman Steve Kalafer. This is the first time the Somerset Patriots are presenting the Community Leadership All-Star Award. The team plans to honor individuals and organizations on an annual basis at special events and at the ballpark. The Somerset Patriots won the 2015 Atlantic League Championship, their sixth in 18 seasons of play. The 2016 schedule has been released and can be viewed on-line at www.somersetpatriots.com. For more information about the 2016 season, stop by TD Bank Ballpark, call (908) 252-0700, or visit www.somersetpatriots.com.